Pápai Páriz Ferenc, Album amicorum p. 393. * Horace, Carmina 3.3.1-8. We have included the English translation by John Conington. The verse is also quoted by Sámuel Fáy on p. 475. 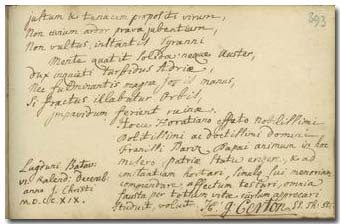 Henri Gabriel Certon was born in Dordrecht on February 20, 1697, the son of the French emigrants Henry Louis Certon and Marianne de Marchezalliers de Bellevue. He studied theology in Leiden, and from 1725 he was a Vallon preacher in Dordrecht. He retired in 1753, and died in Dordrecht on May 28, 1754. His sermons were published in 1803 in three volumes. He married Marie Langlois, and they educated two sons and two daughters. A son of theirs, Henry Abraham (1735-1808) was the Vallon pastor in Rotterdam. This Horatian quotation and the recommendation of Henri Gabriel Certon belong to the most direct allusions to the situation of Transylvania in the album. These same Horatian verses were quoted also by Sámuel Fáy in Vienna in 1726 (p. 475).